For every bad deed we report, there seem to be more selfless stories of those willing to step up and do the right thing. Such is the case with the beating of 15-year-old Anthony, an autistic teen with severe asthma. Antony was attacked by two males, an 18-year-old and a juvenile, last month near his home in Canoga Park. They approached him and savagely beat him in front of his two eight-year-old sisters. They then stole his cell phone and took off, leaving the three siblings in shock – and Anthony with broken bones. LAPD Topanga Station Detective Valencia took the case, and investigated all leads. 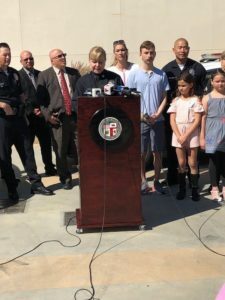 Recognizing the victim’s special needs, he reached out to LAPD Senior Lead Officer Duke Dao, who immediately put the story out on social media. Anthony needed a new iPhone to be able to keep in touch with his parents about his asthma. “It’s his lifeline, literally,” said Dao. “This is my community,” said Dao, “I grew up here and have a stake here. But I know the community also cares.” Dao asked for donations to purchase a new phone for Anthony. Not 48 hours passed before he had fully funded the phone – primarily from donations of $25 each. His first call on the new phone was to his dad.